Checkers, also called draughts, is an interesting game. all pieces are placed on black tile and are all pawns at the start. When a pawn reach the final line, a powerful piece is created: the Queen. It can move multiple tiles on the same move. What is the maximum number of black pawn you can take in a row? Can you prove that this number is optimal? I want to remind that queen can go back, stop anywhere behind the pawn taken. Pawn won't disapear until the end of the whole move (so their tile will remain inaccessible for the queen) and you can't eat the same pawn twice! That one doesn't have a path to capture all the pieces though: the marked squares near the corners have exactly one way to enter or exit them, and there's no way to capture the neighbouring pieces without visiting those squares. Therefore, each marked square would need to be an endpoint for the path, and given that there are four such squares, this is clearly impossible. Although this does not constitute a formal proof on any kind, I myself am convinced that the above answer is the best one I'm ever going to find. I can prove that UselessInfoMine's solution is optimal. 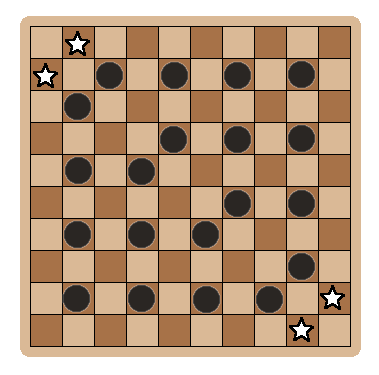 Divide the black squares of the checkerboard into two groups, A and B, as shown. Every capturing hop is between two squares of the same group, hopping over a square of the opposite group. This means that all the captured pieces must be on squares of the same group. Furthermore, captured pieces cannot be on the edge. 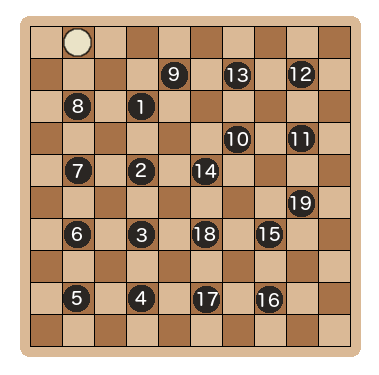 Since there are only sixteen internal squares in each group, a queen can only capture sixteen pieces in a single turn, which is achieved by UselessInfoMine's solution. Not the answer you're looking for? Browse other questions tagged strategy optimization checkerboard or ask your own question.